Manager Jon Hall has released details of a youthfull 17-player under-11s squad for the Yorkshire Festival team in 2019. In alphabetical order they are: Joe Birks [Skipton], Thomas Chapman [Earby], Thomas Durn, Harvey Green [Settle], Caleb Gledhill [Steeton], Alex Hall [Earby], Harry Hinchcliffe [Crossflatts[, Abdullah Hussain [GHC], Ben Jolly [Earby], Noah Kennedy [Skipton], Awais Khan [GHC], Ryan Lee [Skipton], Rhys Mazey [Crossflatts], Thomas Mountain [Embsay], Tom Raby [Oakworth], Oliver Riley-Ratcliffe [Embsay], Sam Stoneman [Sutton]. Thomas Chapman will be the Captain. An exciting four team T20 competition at the vast Kendal CC ground will provide a challenging start on 30th May to the year, playing against 3 Counties. Our toughest fixture to date. A trip to the vast Kendal CC gives UAJCA u-11s an early taste of tough competitive representative cricket. UAJCA will face Cumbria and two other counties or Regions in the fast growing format. The Yorkshire Festival begins with a long-distance trip to Malton & Old Malton CC to face the York District. There are then two home matched against Pontefract and Bradford at Oxenhope and Airedale clubs. All matches start at 1:00pm. UAJCA trials are to beheld on Sunday 7th April at South Craven Indoor Hall at 2:00pm with UAJCA managers Jon Hall and Mark Stoneman. Nidderdale advise us that the planned u-11 20-20 for 4 teams at Harrogate CC rained off on 26th August is now to be held on Sunday 9th September. Beckwithshaw CC did not prove a happy hunting ground for UAJCA u11s who slipped to defeat in the return match with Nidderdale. Several 'newbies' helped out due to holidays and cup finals and the team made a great game of it just falling short at the end with the bat. Excellent start from Moeed, Tom Raby (u10) , Joe Birks (u10) and Harry meant only 31-2 at half way. But a good partnership from their skipper and Barker meant we had a bigger total than hoped to chase. A strong start from the openers was sadly cut short by a run out from great fielding, and then a mix up led to a 2nd run out which slowed the fast scoring rate and meant we were half way, at half way, but with half the wickets gone!!! It was still a good contest which could have gone either way but the spin attack was held in reserve and this ripped through the tail. Still there were some good performances and the stand-ins stood- up very well to the task against a good team. Well done all and thanks for making a game of it. Oxenhope CC proved a happy hunting ground for Nidderdale u11s who gained an 8-wicket victory. UAJCA bowlers found it tough going against the Nidderdale batsmen, their top 3 all retiring. Five wickets later fell when they batted on, 2 of them to under-9 Max Lampkin. With the bat new boy Leighton Meeking shone with 9 and also took a wicket and engineered a run out. Another new lad Izaac Walker also did well with 8. Adam Harding had his best knock for UAJCA with 17. Sadly only skipper Huey Cunningham was able to match his double figures. The return match is on 19th August at Beckwithshaw when a return to the form of the match against the Bradford League would be nice. Got off to a steady start but fell away until late order rally. No-one could stay long enough to build their innings apart from Hamza and some impatience led to 5 catches and 2 stumpings. The bowling proved to be better but the total wasn’t enough to defend over 35 overs. Again catches were held and fielding for the most part improved on earlier games. Team: Hamza [Capt], Aaron, Will, Jack, Max, Adam, Luke [wk], Moeed, Owais, Harry with Lewis Hayes-Head joining the squad for the first time. 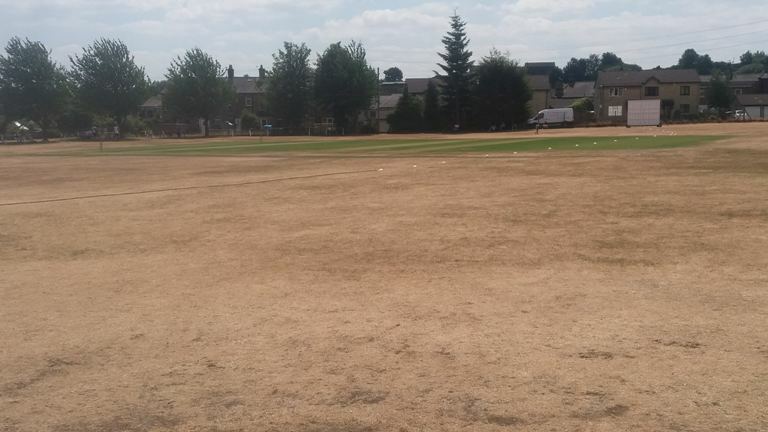 Sunday's visit to the Bradford League in the Yorkshire Festival took place at Woodlands CC, somewhat resembling a desert in the drought-like conditions. UAJCA won the toss and opted to bat. The early loss of Will Lampkin [Bradley] and Adam Harding [Embsay] was a set-back and Hamza Saeed [GHC] and Huey Cunningham had to forge a partnership to get on to a different track. They did so in some style carrying our total to 48-2 after the first 10 overs. They continued and pushed the run-rate beyond 5 per over. Hamza was retired for a cracking 56 by Ji at around the 80 mark to bring Jack Caton [Settle] in to join Huey. Huey grabbed the initiative whilst Jack dug in. Huey was bowled by an effective if erratic Will Knowles for a smart 30. But the aggression continued from Aaron MacRae [Skipton] who was dropped by Phillips on 12 but then caught the next ball with an amazing grab. Max Williams [Oxenhope] was unlucky to be run-out when there wasn't really a single there. Mustapha Hussain [GHC] joined Jack and the run-rate stalled a little. Jack was retired for a steady 3 and Harry Atherton [Steeton] took guard. Mustapha was bowled for 4 but Harry began to strike with some assurety. The Bradford bowling had deteriorated under the pressure and no doubt the heat. Harry's 22 no with help from Embsay's Luke Lovell  propelled UAJCA to a terrific 176-7. For Bradford, Will Knowles led their bowlers [2-17]. The Bradford openers Liam Phillips and Hudson Rowan faced a daunting task at 5.87 per over. Early pace from Moeed Shafiq and Owais proved wicket-less but conceded just 32 runs in 8 overs. Will kept things under control whilst the pace of Hamza always had the batsmen under-pressure. By the 10 over mark they had fallen 15 behind the UAJCA rate. Jack couldn't repeat his 4 wickets at Pontefract but gave just 12 runs from his 3 tidy overs. After 20 overs the Bradford pair were swell settled with their score standing at 95-0. A rate of 8.2 per over would be required to upset the UAJCA effort. They accelerated whilst the UAJCA bowling and fielding began to fall apart. The harder they tried the worse it got. Aaron and Mustapha suffered most but Max and Harry were to be key factors at the finish. Harry's 2 overs at the death cost only 6 runs whilst Max and Owais kept their heads to find Bradford needing 11 to win from the last over. They fell 4 runs short to a very relieved UAJCA contingent. For Bradford, Phillips was run out off the last ball for a magnificent 88 whilst Rowan had a well constructed 46no. The 39 extras conceded by UAJCA reflects the degree to which their bowling & fielding control fell away. But they won, a second match from the 3 but it seems unlikely they could overhaul the points total by the York League. 25th July sees the boys travel to Kendal to play a full county side from Cumbria. Following this win they should be able to draw on their reserves, much needed at Woodlands. The visit to Ackworth CC provided opportunity for the batsmen to redeem the poor performance against York, but initially it was the bowlers who set up the win. Star of the show was undoubtedly Jack Caton [Settle] whose 18 balls cost just 2 runs and brought him 4 wickets! Owais Mahmood showed his 20187 form with 2-18 and there were single wickets for Hamza, Max, Moeed & Harry. The Pontefract 92 all out was distinctly within our sights. But the early dismissal for Adam Harding threatened our hopes. Fellow opener Will Lampkin showed his league form with 17 and shared a good partnership with Huey Cunninham who tallied 9. Hamza also showed previous form with 23 and the coup de grace came from man-of-the-match Jack Caton [17no] and Moeed 10 no. A six wicket win inside 13 overs was a far cry from last week. Now for the Bradford League at Baildon. UAJCA bowlers peformed well against most of the York League batsmen, with the exception of number 4 J Hall. He went on to score a match-winning 78 before Huey Cunningham caught him for Hamza Saeed. Earlier Moheed Shafiq [3-14] had removed the top 3 and later Max Williams [3-13] evicted the middle order. Hamza Saeed [2-23] also featured. To have the visitors to sunny Upper Wharfedale all out for 167-9 was a good performance in the light of Hall's knock. But it was with the bat that UAJCA lost the match by 85 runs. Only 3 batsmen reached double figures with top knock going to Steeton's Huey Cunningham . Aaron MacRae and Moheed Shafiq also added 16 and 11 respectively. M Dodsworth [3-4] and F Ricjardson [2-1] were the chief architects of our demise. Lets hope for better fortune at Ackworth CC against Pontefract. Team: Harry Atherton [Steeton], Jack Caton [Settle], Adam Harding [Embsay], Mustapha Hussain [GHC], William Lampkin [Bradley], Luke Lovell [Embsay, w/k], Aaron Macrae [Skipton], Owais Mahmood [GHC], Hamza Saeed [GHC], Moeed Shafiq [Skipton], Max Williams [Oxenhope] & Huey Cunningham [Steeton]. Standby reserves were Niall Sagar [Earby] & Aaron Wiseman [Earby] . Having lost the toss UAJCA batted first in a well fought even match. Our lads stood up well to some good bowling and set a challenging target. In the 2nd half we dropped several catches and missed a couple of run outs but showed composure at the end. Will Lampkin [UAJCA] and Piyush [New Delhi] were players of the match and the Indians were gracious in defeat despite a last ball mix up which could have ended in a win for them! Well done to all especially the parents for braving the cold. 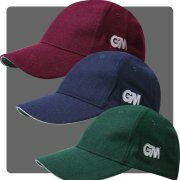 The bowling highlights for New Delhi were: Vidansh 5-0-19-2 and Gunmay 4-0-18-2. With the bat for New Delhi, Dhanya scored 24, Ishprit 20 and Piyush 26. The next match is a Yorkshire Festival match at Upper Wharfedale CC vs The York League on Sunday 1st July [1:00pm]. Harry Atherton [Steeton], Joe Birks [Skipton], Jack Caton [Settle], Adam Harding [Embsay], Mustapha Hussain [GHC], William Lampkin [Bradley], Luke Lovell [Embsay, w/k], Aaron Macrae [Skipton], Owais Mahmood [GHC], Archie Phillipson [Embsay, Capt], Hamza Saeed [GHC], Moeed Shafiq [Skipton], Max Williams [Oxenhope]. Standby reserves are Niall Sagar [Earby] & Aaron Wiseman [Earby]. Our final match of 2017 at overcast Skipton CC with N Yorks District u-10s proved a low scoring but interesting game with lots happening. Skipper James Powell won the toss and opted to bat. Our two wicket-keepers Leo Garner and Jacob Stephens opened up and found the opening salvoes difficult to score fro, such that after 5 overs we had just 4 on the board. Jacob found the middle and three cracking fours crossed the rope before he was run out by a direct hot from behind the stumps for 14. Leo took a boundary but was out for a patient 6 also run out with Charlie Jackson at t'other end. The score was 32-2 after 13 overs. The skipper soon settled but 3 overs later Charlie was stumped by the live -wire NY keeper Freddie B for just 3. James was joined by club-mate Jacob Davies at 39-3. Jacob was unfortunate to receive the ball of the match with a superb late swing from leg to off by Leo W which knocked over his pole for 2 at 41-4. Lucas Lockley overcame his nerves but missed out on some leg-side deliveries and also made 2 before being bowled by the leg-spin of Louie Wilson. Meanwhile James was finding his middle to good effect but not always the gaps in the field. Henry Meynell joined the battle and helped carry our total on to 55 before he was a first victim for Matty F, coming round the wicket after a wayward spell over it. Dan Grimmitt was the man to really partner James aand they another 10, 6 to Dan caught off the same bowler. James was now in full flow but a full-bloodied drive was caught by the bowler for his 3rd wicket at 74-8. Thd einnings subsided with Matty F picking up the last 2 scalps before Richard Bradley could face a ball. Matty F's introduction snuffed out any semblance of turning defence into attack with an eventful spell of 5-16 including the key wicket of James Powell who made 17. 74 all out in 28 overs was not brilliant but it was a difficult low wicket and maybe could be defended. Openers Matty F and Joe H added 15 before the latter was smartly caught for 2 by keeper Leo Garner for a deserved wicket for the troublesome Stan Lloyd. By the 10th over North Yorks had also found scoring hard to come by and stood at 24-1. Number 3 and keeper Freddie B had his stump lknocked out of the ground, yorked by a speedy Henry Meynell for 5. After 15 overs N Yorks had 35-2, not yet at half our total and when Joe Birks was run out by James Powell for 1 and then Matty F followed for 10 bowled by Dan Grimmitt suddenly 44-4 gave UAJCA a sniff of victory. But our 'own' Archie Phillipson and Jack R steered the NY boys over the line with 77-5 in the 21st over. Well done to NY, we'll be taking you again on next year in your midden!! The much awaited return visit by Cumbria for the u-11s at Settle CC on Sunday [13th Aug] has been called off by the Cumbria management, due to shortage of players. The much awaited return visit to Cumbria for the u-11s was cancelled to to a waterlogged pitch at Milnthorpe CC. Maybe next year boys. The Yorkshire Festival semi-final at Ossett CC was handed to the Heavy Woollen District by their umpire, who adjudged UAJCA to be run out off the last ball. A tied match would have seen UAJCA progress to the final having lost fewer wickets than Heavy Woollen. Earlier at 80-7 chasing 120, UAJCA seemed out for the count but Henry Meynell [Bradley] and Jacob Davies [Oakworth] forged a superb partnership to take us to the brink, only to be denied by the umpire's finger. Next week UAJCA u11s will take on Cumbria at Milnthorpe, hoping to make up for the disappointment. Team Manager Richard has selected the following team to take on Heavy Woollen District at Ossett CC on Sunday 23rd July in the semi-final of the Yorkshire Festival. James Powell [Oakworth, Capt], Jacob Stephens [Cullingworth], Jacob Davies [Oakworth], Henry Meynell [Bradley], Declan Harrison [Earby], Parth Sunil [Cullingworth], Stan Lloyd [Cononley], Charlie Jackson [Cullingworth], Leo Garner [Earby], Ben Hall [Earby], Daniel Grimmit [Cullingworth], Ed Whitlam [Skipton]. UAJCA fabulous under-11s won for a third time in the Yorkshire Festival and have qualified for the semi-finals for the second time in 2 years, where they will meet Heavy Woollen District at Ossett CC next Sunday [23rd July]. On 16th July UAJCA hosted Wetherby League at a very hot & sunny Oxenhope CC. UAJCA won the toss and elected to bat and totalled 138-6. All our batsmen contributed with Charlie Jackson  and keeper Leo Garner [21no] the two highest. Ed Whitlam added 13 from just 6 balls to boost our total towards the end. The opposition was though strong and our total was always in their sights. That they ended their 30 overs on 130-6 shows the closeness of the contest. Their leading light was Haider Ali who retired on 52 no. UAJCA bowlers were well led by Declan Harrison whose 5 overs cost just 9 runs, although wicket-less. His opening partner Stan Lloyd was in top nick taking 3-20 in his 6 overs. Leo Garner was also a live-wire behind the stumps. It was a thoroughly professional performance from a team now growing in confidence. Oakworth CC was a gloriously sunny setting for a tremendous UAJCA u-11 performance. Having defeated Aire-Wharfe the previous week, the batsmen set about the Huddersfield bowlers from the off. The losses of Parth and Jacob with the score at 20 wasn't seemingly a hindrance as Ben Hall and skipper James Powell took charge. The added 63 runs in 18 overs before Ben was out for a dominant 36. James combined with Charlie Jackson to continue the attack. 6 runs on James too was out for 35. Charlie shared good late order stands with Henry Meynell and Leo Garner in total amounting to 36 runs. Charlie was not out 14 and Leo not out 10. Henry was run out for 12. 125-5 gave us maximum batting points. But Declan Harrison really started the ball rolling towards victory with 3 wickets in 4 scintillating overs to leave Huddersfield at 19 for 4. None of the Huddersfield batsmen got a hold of any of our bowlers and 1st change Luke Spragg, now back in harness, whipped out 2 more to add to a couple of run outs from Henry and himself. The Huddersfield innings was finally brought to an end after 15.3 overs at 40 all out. UAJCA now sits at the top of the group and after Aire-Wharfe defeated Wetherby it is clear only a disaster can stop us reaching the semi-finals, where we would likely meet Heavy Woollen. At Alwoodley CC UAJCA u-11s took a great step towards a second successive Taverners' Final with a 3 wicket win over Aire-Wharfe. Cullingworth's Charlie Jackson led our bowlers in style, taking 3-16 in his 6 overs. But it was far from a one-man show as opening bowlers Stan Lloyd [Cononley] [2-7] & Declan Harrison [Earby] [0-11] set the early tone. Jacob Davies [Oakworth] cleaned up the lower order with 2-11. The Aire-Wharfe total of 102-8 was boosted by 24 from Ishu Roy and 18 to no 7, JJ Aldred. Our batsmen started poorly with cheap losses of Ed Whitlam and James Powell but opener Parth Sunil  combined with Jacob Davies  to move the scoreboard forward. But at 36-3 after 15 overs our position still wasn't healthy. Our middle order really came to the party with 18 from Henry Meynell [Bradley] and 21no from Ben Hall [Earby]. Leo Garner added 10 and the target was reached with 7 wickets down with 10 balls remaining. It was a great result and with 2 Home games left we have every chance of progress to the semi-finals. The next match is at Oakworth on 9th July against Huddersfield. Bradshaw CC was the venue for UAJCA u-11s without our 4 District players, to bat first but with a run out for Ben Hall  and the loss of Parth Sunil  it may not have been the wisest option! It got worse with the loss of Lucas Lockley also for a duck at 16-3. The fight-back came from Cullingworth pair Charlie Jackson  and Dan Grimmitt . Charlie was bowled at 39-4 after 17 overs. That brought Leo Garner [Earby] to the crease and firstly with Dan added 33 to the total including a bevvy of extras. On Dan's loss, also bowled, Ifzaan Shafique [GHC] joined the fray and helped Leo add another 50 runs with continued wayward Halifax bowling. Leo remained 35no whilst Ifzaan made a useful 10 in our final score of 123-6 in 30 overs which included 41 extras!! As in our innings Halifax lost an opener to a run-out but recovered to 31 before the 2nd wicket fell lbw to Charlie to be quickly followed by a 3rd from Elliot Ashley [Skipton]. Halifax no 5 Dimbleby held their innings together with a fine 30. From 70-5, threatening our total, our bowlers knuckled down to enable Ben Hall [Earby] to clean up the tail with 3-8. Halifax were all out for 98 in 21 overs. Charlie returned 2-7, Elliot 2-25. Another useful preparation for the forthcoming Festival match on 2nd July at Alwoodley. UAJCA is grateful to Stuart Jackson [Cullingworth CC] for stepping up at Pateley Bridge CC to lead the boys in the absence of both Andrew & Richard with the District side. The team was minus 6 boys, several on District duty, but provided a great opportunity for others to show their mettle. Score-card on right. Bank Holiday week in August will see a fixture for our u11s against a District u10s side from North Yorkshire on Tuesday 29th August. More info shortly. A resplendent Cononley CC was the setting for a first outdoor trial for two of our representative teams. As expected perhaps, the under-11s were comfortable winners, tallying 160-4. The under-10s were all out for 80. Elliot Robinson shone with the bat making 43 before a run-out and fellow opener Ben Hall added a steady 26. For the under-10s their skipper Archie Phillipson led the way with an excellent 33 whilst u11 bowler Ed Whitlam came up trumps with 3 wickets. All-in-all it proved a useful day for the coaches who had a first look at players outdoors with the larger leather ball. UAJCA intends to include this fixture in future years. Thanks are extended to Cononley CC for making their ground available and their provision of liquid refreshment. Andy Keslinke announces his squad to take on Ji Mukherjee' under-10s at Cononley CC on Sunday [2pm] which includes 4 District players. Elliot Robinson [Capt], Jake Keslinke, Charlie Jackson, Jacob Davies' Jacob Stephens, Leo Garner, Declan Harrison, Stan Lloyd, Ifzaan Shafique, Parth Sunil, Ed Whitlam & Ben Hall. The match will be 25-30 overs to give each coach a view of player's current form in a competitive scenario in advance of YJCF matches. Bring it on !!! Following the highly successful 2016 season under manager Alistair Harrison, the 2017 UAJCA u-11s will have joint managers Andrew Keslinke and Richard Powell [both Oakworth CC] at the helm. Elliot Robinson, Jake Keslinke, James Powell, Leo Garner [wk], Jacob Stephens [wk], Ben Hall, Parth Sunil, Ifzaan Shaffique, Henry Meynell, Charlie Jackson, Ed Whitham, Jacob Davies, Elliot Ashley, Stan Lloyd & Declan Harrison. A Captain will be named once County & District commitments are clarified. A gloomy misty day was the backdrop for an enthralling 35-over match at Oakworth CC between UAJCA u11s and Cumbria u11s. Cumbria won the toss and opted to bat first. With just 6 on the board Cumbria lost opener Rose for 5, caught behind by keeper Max Hibbert for Lewis Brown. It was a great start for UAJCA and 11 runs later fellow opener Sawden was also back in the pavilion for 4 at 17-2 in the 7th over. Hansford & Wilford settled the visitors' nerves and doubled the score, but chief protagonist Hansford was caught by [2nd] keeper Ethan Wilson for 15 for u-9 Thomas Rowell, making his UAJCA u-11 debut. 34-3 in the 11th over was perhaps beyond expectations for UAJCA and Welford's new partner Vasey helped a recovery. Charlie Mitchell bowled tightly and Thomas recovered from a nervy first over. Leg-spin from Charlie Raby was introduced with mixed results as the two young Cumbrians built a 63-run partnership in 12 overs. The bulk of the scoring had come from Welford but it was partner Vasey who was run-out by live-wire Charlie Mitchell at 97-4. There remained 12 overs to bowl but it was cue for Jake Keslinke to enter the fray and he removed Welford for a well-crafted 51 [5 fours] at 107-5. Big hitter Winter joined the stubborn Vasey and he added a quick-fire 14 before he too succumbed to Jake's accuracy at 122-6. 8 runs later Jake added the scalp of no 6 Holt, also bowled for 5 in the 30th over. Jake came off with 3-13 in 4 overs of class bowling.. Skipper Lewis returned to pick up the wicket of O Yarker for 2 to leave Cumbria at 133-8 in the 32nd over. The Cumbria total settled at 139-8. UAJCA bowling had been exceptionally well controlled with 4-1-16-3 for Jake, 8-1-30-2 for Lewis, 8-1-23-1 for Max Harrison and a superb 6-1-28-1 for young Thomas Rowell. Embsay lad Archie Phillipson was promoted to open with Ethan Wilson and the pair posted a 33 partnership, aided by some surprisingly wayward bowling from the Cumbrians. The exception was opener Luke Davey, a quality left-armer, who ultimately conceded just 11 runs in 7 overs, Ethan was run out for 14 and Jake Keslinke got off the mark with a boundary. Archie was taken a ill and had to leave the field to allow James Powell onto the turf. Jake was next to fall, stumped off O Yarker for 5 at 40-2 in the 8th over. Ben Slade was next and helped take the tally to 56 but wides and no-balls were the principal scorers before Ben was bowled by Yarker for a lengthy 0. Captain Lewis Brown paired with club-mate James and was soon showing obvious class. James seemed a little under-powered but remained solidly resolute. Eventually James got going and the pairing, led by Lewis propelled the innings forward by a scintillating 61 runs in 8 overs onto 117-4 when James was bowled by the impressive Davey for 12. Only 27 overs had been bowled and Lewis was now in full flow with the pendulum clearly swinging towards UAJCA, Max Hibbert stayed briefly for 1 and Charlie Mitchell chipped in a rapid 3. At 136-6 the match was all but won as Lewis passed the 50 mark and then Max Harrison hit the winning straight drive to the boundary to put up 140-6 as our winning total. For Cumbria Davey looked a cut above for his 7-2-9-3 whilst Yarker bowled well for 6-1-19-2. For UAJCA it was a real experience playing a 35-over match against high-level opponents and the learning in how to manage the match was there for all to see. For Cumbria the excellent innings from Welford and fine bowling from Davey was wasted with their donation of 40 extras to UAJCA with wayward bowling and several fielding lapses. For a team to outscore by 126 to 100 from the bat, and then lose the match showed the degree to which they lost their collective way. But what a great match played in fine spirit before a rain-curtailed 10-10 fun bash at the end of the Cumbria visit. UAJCA Manager Alistair Harrison specifically praised his assistants this year in Richard Phillipson, Matt Wilson and Karl Brown, a year with 5 wins and only 2 losses, a major piece of UAJCA history well written and unbelievable progress in 3 months. A lovely day at Scotton was a perfect setting for UAJCA first ever Final [against North Yorkshire]. Our opponents won the toss and chose to bowl. Usual openers Lewis Brown & Ethan Wilson marched proudly out for our historic match. Ethan made just 1 before offering a catch off Ishaq at 3-1 in the 3rd over. And only 4 runs later skipper Lewis Brown was also heading to the pavilion for 6 bowled by an impressive Phillips at 7-2. Ben Slade and Archie Phillipson found themselves at the crease earlier than expected and staged a fight-back which pushed UAJCA on to 25 in the 10th over. Archie copped a ball on his right hip and had to leave the field for a little attention and Jack Midgley took his place alongside Ben. Spinner Knaggs upset our rhythm and Jack fell for 7 ct & b by Miller. Archie bravely returned to join Ben, who was bowled by Knaggs for 9 at 30-5. Archie was next deceived by the dip from Knaggs for 2 at 32-6 and the innings was in danger of falling apart. Charlie Mitchell and Wilf Roberts began a rebuild and the 50 mark was passed. Wilf was stumped attacking Knaggs but his 15 singles had been much needed at 53-7. Charlie remained unbowed and left-hander Dylan Canny put bat to ball in determined mood. Charlie added just 2 but a controlled innings from Max Hibbert combined well with Dylan and the pair advanced our score to 91 when Max was bowled for 10 by Miller. 91-8 looked much better than 32-6 and with help from Khunas Zaman and t'other Dylan [Blenkhorn] we reached what was hopefully a competitive total of 101-9. Dylan Canny finished 25 not out, our batting hero. NY Spinner Knaggs ended with 4-19 and Miller 2-16. Miller opened with Fox against Lewis and Dylan C and UAJCA had reward with the wicket of Fox for 13 at 29-1 in the fifth over. North Yorkshire had found batting much easier as our bowlers lacked control of length, which Miller punished in style, New batsman Phillips was also in top form for NY as our bowlers wilted, hitting 9 fours in his 39no. Miller went on to tally 45no [6 fours]. North Yorkshire had proved much the better side overall reaching their target in just 13.2 overs, thanks to the aggression from Phillips. Captain Lewis Brown returned a creditable 1-13 from 4 overs but our attack in total was a little off song. Our first ever final had ended in defeat but our fight-back with the bat had epitomised our fighting 2016 campaign of which we are all extremely proud. Well done boys, history makers. Jack Midgley [U Wharfedale], Dylan Blenkhorn & Ben Slade [Earby], Wilf Roberts, Max Hibbert & Charlie Mitchell [Steeton], Lewis Brown & Charlie Raby [Oakworth], Ethan Wilson [Skipton], Khunas Zaman [Gt Horton Church], Archie Phillipson and Dylan Canny [Embsay]. Tom Slater, Jensen McGregor and James Powell are unavailable. Our amazing run to the final has been wondrous and without County picks Max Harrison, Elliot Robinson, Lucas Robinson and Adam Hodge. Its testament to the growing strength in UAJCA. Lets have lots of support for the boys and we will overcome North Yorkshire [Cleveland]. An amazing team performance from our boys has taken UAJCA into its FIRST EVER Yorkshire Festival FINAL !!!!!!! Lewis and the team excelled with self-belief and top-notch fielding and despite e very spirited challenge from Doncaster emerged victorious by 3 wickets. See report in the next column. Lets have some amazing support at Scotton CC for the Final against either North Yorkshire or Heavy Woollen. Come on out in force and show support for UAJCA!!!!!! Next Sunday 24th July is set to see UAJCA in its 2nd under-11 semi-final [1:00pm]. The venue will be Silsden CC and our opponents will be Doncaster District. Embsay's Archie Phillipson comes into the squad from the under-10s after impressive displays. The full squad is; Lewis Brown, Charlie Raby, Wilf Roberts, Jack Midgley, Charlie Mitchell, Max Hibbert, Dylan Canny, Ethan Wilson, Kunas Zaman, Jensen McGregor & Archie Phillipson. Tom Slater, Ben Slade & Dylan Blenkhorn are unavailable. The face-book messages were flying in abundance as news filtered through that Aire-Wharfe had lost to Huddersfield. For UAJCA had comprehensively defeated Wetherby at Thorpe Arch CC. Which district has the most points.... we'll find out tomorrow!!! A really classy opening partnership from skipper Lewis Brown and Ethan Wilson set UAJCA on a rapid road to a decent score. Lewis again looked in good form but not for the first time fell shy of his potential for 21. Ethan maintained his excellent season's run-gathering and went on to add 37 to his tally. Dylan B, Max and Charlie restored our progress after losses of Ben and Jack, previous high-scorers themselves. The Wetherby bowlers were somewhat ill-disciplined in their lines and gifted UAJCA a staggering 45 extras. For their attack F Brookes picked up 3-12, A Hudson 2-9 and T Thornhill 2-5 to take some solace from their overall effort. The skipper may have under-performed slightly with the bat but with the ball he was sensational with 6-1-7-3. The middle order succumbed to Charlie Mitchell [2-14] and Jensen McGregor cleaned up the tail in 1 over with 3-0. The Wetherby collapse was complete at 74 all out with only M Fairbank adding a fair contribution with 21. Alistair's squad travelled to Lascelles Hall CC on Sunday with Lewis [Capt], Jack M, Ethan, Charlie M, Wilf, Charlie R, James, Khunas, Ben, Dylan B, & Jensen. The boys came away with a 4 wicket win to open their account with 1 match to play against Wetherby, hoping Huddersfield can over-turn Aire-Wharfe. UAJCA lost by 4 wickets to Aire-Wharfe at sunny if windy Silsden CC. UAJCA batted first with opener Ethan Wilson resilient in defence whilst sadly skipper Lewis Brown was caught in the covers when just getting into his stride. An unaccustomed duck for Tom Slater was a second blow. Charlie Mitchell teamed up well with Ethan but our run-rate was falling. This was eventually arrested by Ben Slade and Jack Midgely who again put bat to ball to take us up to a 'par' score of 89-6. Four of our players were caught in the covers driving but without full power which otherwise might have made boundaries. Knowing the run-rate required the Aire-Wharfe openers got ahead of the rate as we toiled to separate the pair. Charlie Raby eventually got the breakthrough and skipper Lewis also made his mark. Our fielding was very mixed with difficult catches taken by Ben and Jensen but at least 4 easy ones dropped. Charlie Mitchell enhanced his reputation adding 2 wickets to his 10 runs as matched the Aire-Wharfe wicket-taking tally. But the accelerated run-rate was our undoing along with the dropped catches. Fielding as a whole proved the difference, whilst at Scarborough it had been a high point. Manager Alistair Harrison will probably retain most of the team with minimal changes for the next match at Lascelles Hall against Huddersfield on Sunday. UAJCA manager Alistair Harrison has selected the following squad for the Aire-Wharfe match at Silsden CC. Lewis Brown [Capt], Ethan Wilson, Max Hibbert, Tom Slater, Charlie Mitchell, Ben Slade, Wilf Roberts, Khunas Zaman, Charlie Raby, Dylan Canny, Jack Midgley, Jensen McGregor. Max Harrison and Lucas Robinson are unavailable due to County calls whilst under-10s are required for District matches. UAJCA batted first at the beautiful Wykeham CC ground with Ethan Wilson [Skipton] and skipper Lewis Brown [Oakworth at the crease. Ethan was first to depart for 3, ct off opener Vance at 15-1. No 3 Tom Slater settled with Lewis and the pair set about the Scarborough attack. They added 54 runs before Lewis was also caught off Fraser for a fine 23 [3 x 4s]. From 69-2 UAJCA slumped to 73-6 with 3 ducks and also the scalp of Tom for 29 [4 x 4s]. When Max Hibbert [Steeton] became our 4th duck at 78-7 our fine start was all but dissipated. He was a fourth victim for the impressive G Fraser who had 4 wickets for 21. Charlie Mitchell [Steeton] added 11 inc 2 boundarries to take us to 90-8 before he too fell. Another 13 came from Ben Slade [Earby] and Jensen McGregor [Bradley] in a cracking rear-guard fight-back. Jensen made 7 and a further 10 came for the last pair Ben and Wilf Roberts [Steeton]. Our tally of 113-9 was highly competitive with Ben's knock of 17no [3 x 4s] crucial to the UAJCA cause. After a sumptuous tea, Scarborough took guard with Edmund and Baxter but as with UAJCA an early wicket [Baxter 3] from Dylan Canny [Embsay] at 6-1. 9 runs later no 3 Coates was run out at 15-2 in the 6th over. Edmund and Vance restored some composure but their 25 run stand was broken with the introduction of leg-spinner Charlie Raby [Oakworth]. He picked up Vance for 15. In something of deja-vu Scarborough lost 3 quick wickets including opener Edmund for 14 by Charlie. So Scarborough stood at 43-6 in the 15th over and suddenly our 113 seemed a mountain to climb. The recovery came from A McDonald and that man Fraser. They added 18 but at 61-7 McDonald was ct & B by Jensen as a sever blow to the home side. Edwards fell at 66-8 in the 22nd over, a fourth run-out as the batsman panicked a little. A ninth wicket stand of 15 gave some hope but no 10 Grunwell was caught off Ben Slade at 81-9. The innings finished at 89 all out in the last over. Charlie Raby had bowled superbly for 2-19 from 6 overs to break the top order. There were top-notch performances from all the 9-man attack in support of the magnificent effort from the batsmen. And there was special mention of Ben Slade for his 17no and 1-6. Skipper Lewis wasn't called upon to bowl. It was a great win against very tough opponents and augurs well for YJCF. UAJCA and Heavy Woollen District are to postpone the proposed Super Cup match in view of a date clash with the YCB u10s trials. However the match will take place later in the season once a date is agreed. Jack Midgley & Tom Slater [U Wharfedale], Lucas Robinson, Adam Hodge, Dylan Blenkhorn & Ben Slade [Earby], Max Harrison & Jensen McGregor [Bradley], Wilf Roberts, Max Hibbert & Charlie Mitchell [Steeton], Lewis Brown & Charlie Raby [Oakworth], Ethan Wilson [Skipton], Khunas Zaman [Gt Horton Church] and Dylan Canny [Embsay]. UAJCA is honoured to be asked to play against a whole County - Cumbria as part of their summer programme. It will be a real test for our u-11s development and a great opportunity to play at a high level. The prestigious match with our under-11s side will take place on Tuesday 2nd August at Oakworth CC. It's an 11:30am start and a 35 over match. The fixture to take part in a 3-team round robin 20-20 hosted by Scarborough District and also featuring South Yorkshire is now confirmed. We just await the venue details. Buckets & spades at the ready for a Bank Holiday day out!! Our first match is timed for 12:00 noon, probably against South Yorkshire to be followed by a match vs Scarborough. UAJCA is pleased to announce that Alistair Harrison [Bradley CC] will be the 2016 Team manager for the under-11 Representative team. Alistair is also the manager-coach for the North Yorkshire [West] under-10s and will bring experience from assisting last season. We wish him well. An excellent bowling performance from UAJCA limited opponents Barnsley to 95 for 7 at a rain-threatened Bradley CC. Skipper Johnny Atherton [Steeton] led the way with a brace of wickets but a lot was owed to openers Jack Luxton [Steeton] and Anthony Clark [Settle] who bowled 12 overs between them for just 23 runs to give us a great start. Only the Barnsley openers reached double figures although our Extras total was again too high at 34. With the bat, Barnsley opening bowler Kazim Hassan removed both Johnny and Jacob Terry [Cullingworth] for very little to have UAJCA immediately on the back foot. No 3 Toby Meynell on his home ground dug in well and a mini-partnership with Imran Abbass [Gt Horton Ch] was halted when Imran was caught for 6 off Wolstenholme. Oakworth's Subhaan Ahmed joined Toby and one again the score progressed. After 14 overs UAJCA had reached 38-3 as the rain curtailed proceedings. For our boys it was disappointing as 58 from 16 overs was eminently gettable. Manager John Terry can look back and feel yet more progress was made with fine performances from Jack, Johnny, Anthony, Toby, Subhaan and Imran. John's young charges gave Aire-Wharfe a run for their money with top bowling from Jacob, Anthony, Imran and Toby. The Aire-Wharfe middle order pulled their side round with 46 from Allinson and 41no from Ralphs. Their total of 154-6 would prove difficult. There were excellent knocks from Anthony, Subhaan, Toby and skipper Johnny but none could go on to register a telling tally. An excellent late stand between Anthony and Subhaan promised much but proved just too little and a late knock of 9 from Kalem also provided hope. 105 all out was a decent response and the team as a whole has certainly moved forward, hopefully with a settled outlook. A number of short-notice absentees, some opting out, spoilt the competitive edge for UAJCA against a very competent Huddersfield side. In the circumstances our eight-men fielded and bowled well to contain Huddersfield to 135 for 3 with 4 retirements. Not surprisingly there was 28 extras in the visitors tally. There was wickets for Jacob Terry [Cullingworth], Imran Abbass [Gt Horton Church] and Kalem Ogden [Oakworth]. Huddersfield top scorer M Weston  went on to also claim 3 wickets. UAJCA batting was well short of the Huddersfield total but the 78 all out included 22 for Toby Meynell [Bradley], 19 for captain Johnny Atherton [Steeton] and 11 for Earby's Luke Chapman. Weston [3 for 5] was ably supported by T Barrow with 3 for 8. Manager John Terry will supplement the squad to replace the absentees. The next match is part of the Yorkshire Festival against Aire-Wharfe at Ilkley CC on 14th June. Team manager John Terry has named the following team for the u-11 warm-up match vs Huddersfield at Cononley CC on 24th May. Johnny Atherton [Capt, Steeton], Max Hibbert [w/k Steeton], Jacob Terry [Culligworth], Seamus Bullough [U Wharfedale], Imran Abbass, Saqif Ali, Mohammed Rohaan & Mohammed Abbass [all Gt Horton Church], Subhaan Ahmed & Kalem Ogden [both Oakworth]. The match starts at 2:00pm, players to arrive at 1:00pm. 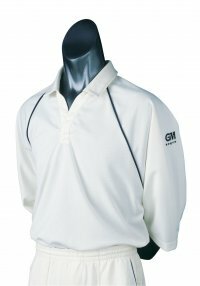 UAJCA kit to be worn. Following the trial at South Craven Centre, Team Manager John Terry announces the following 15-man squad for the 2015 Yorkshire Festival campaign. In addition two standby reserves are named to give plenty of cover for holidays etc. The squad which includes 3 new caps is: Johnny Atherton [Capt], Max Hibbert [w/k] and Jack Luxton [all Steeton], Elliot Robinson & Jacob Terry [both Cullingworth], Subhaan Ahmed & Kalem Ogden [both Oakworth], Saqif Ali, Mohammed Abbass, Imran Abbass, Shamas Zahir & Mohammed Rohaan [all Gt Horton Church], Anthony Clark [Settle], Max Harrison & Toby Meynell [both Bradley]. The standby reserves will be Seamus Bullough [U Wharfedale] and Lewis Brown [Oakworth]. A squad net will be held in advance of the first match on 24th May at a venue to be confirmed. UAJCA is pleased to announce that John Terry [Cullingworth CC] will be the 2015 Team manager for the under-11 Representative team. John is an experienced coach working with Pathways students and North Yorkshire Schools Association. Phil Poole's boys regained their composure after a heavy defeat by HWD to come back and win against Halifax at Cullingworth CC. Upper Airedale completed a fine 11 run victory in a low scoring game. Upper Airedale won the toss and elected to bat and found runs very hard to come by, reaching only 39 for 2 off 21 overs, Will Luxton [Steeton] making 21. The scoring rate exploded from there on with Oakworth pair Owen West & Joel Oxford doing the damage. Owen made 20 and Joel made 29 in quick time hitting 3 massive 6s onto the Cullingworth main road. The innings reached a close at 102 for 5 with Shiv Bhatoa [Cullingworth] 7 no and Brotherton [Settle] 8 no giving Upper Airedale something at least to bowl at, but would need early wickets. Early wickets did arrive through West with Brotherton taking the catch behind and Amrit Sharma [Oxenhope] taking a very smart caught and bowled chance to leave Halifax 12 for 2 after 6 overs. Wickets continued to tumble with 4 more falling in 5 overs, Marshall [Cullingworth] & Johnston [Steeton] each taking 2 wickets, including Marshall bowling Yorkshire A batter Whipp for 16 to leave Halifax deep in trouble at 34 for 6 from 12 overs. A partnership developed between Smith and Siddle but wicket keeper Brotherton produced a moment of magic flicking the ball one handed behind him to run out Smith for 17. Upper Airedale seemed to lose intensity in the latter stages of the game with the match getting closer then it should of been, but Luxton & West finished the innings off in the last 2 overs as Halifax finished on 91 all out. The result was unfortunately not enough to send upper Airedale through to the semi-final even though East Yorkshire had pulled off a shock 10 wicket victory over Heavy Woollen, but it was still an excellent effort to go out on run rate in a very strong group. After running Heavy Woollen very close in 2013, hopes were high 2014 might be even better. It proved just the opposite as their Yorkshire stars proved a class too far for some our boys, who were heavily defeated by 102 runs. Heavy Woollen opener J Smart was dropped off the 2nd ball of the match off Joel Oxford [Oakworth] and he went on to record an amazing unbeaten century . Joel was unfortunately injured in his first over and could take no further part in the match. Pranav Balabhadra [Wilsden] picked up a good wicket in the 3rd over to restore confidence. Smart found a solid partner in L Shuttleworth who scored a fine 31 before Ewan Johnston [Steeton] had him bowled. HWD no 4 J Gill kept up the onslaught and with Smart took a heavy toll on our bowlers, particularly Jacob Terry [Cullingworth]. The pick of our bowlers was Amrit Sharma [Oxenhope]. The 191-2 total was a massive blow to our boys but an impressive performance from Will Luxton [Steeton] and Kyle Welsh [Cullingworth] both of whom batted extremely well after the loss of two early wickets. They shard a great 50 partnership with Will reaching 31 and Kyle 28 before the HWD spinner K Hussain got to work. His four overs brought him 3 for 5 and a tottering performance was finished off emphatically at 89 for 8. It wasn't our best performance against a very competent side, but our young squad can certainly improve on it and re-group for the match with Halifax at Cullingworth on 20th July. UAJCA has been advised that due to a player shortage, Esat Yorkshire is unable to field a team to face UAJCA u11s at Silsden CC on Sunday afternoon [22nd June]. This is the second time this year that UAJCA has been let down by opposition withdrawal. The 'award' of points is no compensation. Team Manager David Hall is to arrange a replacement match against Bradford Schools at a later date. Phil's boys opened their campaign with a Test match at Stainland CC and came away with a 3 wicket defeat after conceding 31 extras. Upper Airedale U11 went down by 3 wickets to Huddersfield on Sunday at Stainland CC. Upper Airedale won the toss and elected to bat first. After the early loss of Bradley Powell for 3 Kyle Welsh and Luke Brotherton put together a steady partnership with Kyle the aggressor hitting some lovely boundaries. Kyle fell LBW for 28 in the 14 over with the score on 40. Upper Airedale really struggled after the loss of Kyle with nerves playing a big part and the innings finished on 73 for 7 from 30 overs. Upper Airedale looked on course for victory when they restricted Huddersfield to 35 for 6 with Shiv Bhotoa 1 for 5 and Anthony Clark 3 for 8 doing the damage. Anthony Clark [Settle] who was called up to the squad this week, produced a fine run out fielding his own bowling. The rain came down and really affected Upper Airedale when they went back to field finding the ball difficult to grip. Huddersfield passed the target in the 25th over with 7 wickets down. Upper Airedale will reflect on 31 extras conceded of which 19 were wides and must improve going into the next match. Manager Phil Poole said they was still a lot of positives to take out of the game, particularly the impressive form with the bat from Welsh, 4 excellent catches and a man of the match performance from new lad Clark. Kyle Welsh [Capt, Cullingworth], Ellis Marshall & Shiv Bhatoa [both Cullingworth], Will Luxton [v-capt, Steeton], Ewan Johnson & Ben Walker [both Steeton], Owen West, Bradley Powell, Joel Oxford & Lucas Keslinke [all Oakworth], Luke Brotherton [w/k Settle], Ahmed Abbass [Gt Horton Church] and Pranav Balabhadra [Wilsden]. The two younger players added to the squad are Jacob Terry [Cullingworth] and Jack Luxton [Steeton]. The first match for the under-11s is on Sunday 8th June, a Test Match vs Huddersfield JCA awaits notification of venue. The 60th Anniversary of the founding of UAJCA is to be celebrated with a curtain-raiser match at the 2014 Cowling Cup Final [CDCL] at Haworth CC on 10th August. Our under-11s will be taking on their older compadres the u-12s at 10:00am in a 20-over match. The gauntlet is down! Tommy Watson [Skipton] & Ellis Marshall [Cullingworth] were the UAJCA heroes as they held their nerve for Upper Airedale to claim a 1 wicket victory in a real nail-biter against East Yorkshire at Sutton-on-Hull. Upper Airedale lost the toss and were asked to field. The wicket was an absolute road and UAJCA tactics from early doors were to contain runs. Unfortunately Upper Airedale didn't claim a wicket but did restrict East Yorkshire to 120 0 off 30 overs, with which the Managers Phil & Dave were delighted. Graham & Johnson both claimed half centuries in chanceless innings. Then it was down to UAJCA batters. Upper Airedale got off to a good start putting on 33 in the first ten overs before Joe Hall [Cullingworth] was bowled for 18 the over before drinks break. Fehzan Khan [GHC], Joe Holderness [Skipton] & Will Luxton [Steeton] fell before the 15th over to leave Upper Airedale up against it at 45 for 4. Harris Rowlett [Steeton] & Corey Green [Oakworth] were at the crease and took the score to 65 for 4 at the second drinks break. Upper Airedale were very much in the hunt needing a further 56 to win off 10 overs. Corey Green was bowled for 3 first over after drinks break which made East Yorkshire firm favourites. A quick fire 23 from Owen Narey [Wilsden] brought the run rate down to 4 an over but when he was bowled and the very next over Harris Rowlett was caught for 32 off a head-high beamer Upper Airedale still needed 20 with just 3 wickets remaining. Tommy Watson & James Mukherjee [both Skipton] took the score to 110 but James was caught for 5 and then Matthew Corkindale [Oakworth] was bowled first bowl to set up a grand-stand finish. Young Ellis Marshall [Cullingworth] joined Watson at the crease still needing a further 11 runs for victory. Marshall stood firm with quick singles with Watson to bring the scores level. Watson hit the winning blow for 4 past square to the delight of everyone with 10no and Marshall 3no. Upper Airedale now need Heavy Woollen to lose this week by a decent margin for Upper Airedale to have a chance of progress. Whatever the outcome it will be a fantastic achievement to finish runners up at worst in a very tough group. Dave Hall and Phil Poole would like to thank all players and parents for there support over the last 3 games and they should be proud of the achievements and represented the Association well. A day of mixed weather greeted UAJCA under-11s trip to Bridgeholme CC for the planned fixture in the 2013 Yorkshire Junior Cricket Festival with Halifax JCA. UAJCA won the toss and elected to bat with Joseph Holderness [Skipton] and Harris Rowlett [Steeton] the designated openers. Halifax opening bowler B Cliffe proved proficient and difficult to master and with 16 on the board he engineered a caught & bowled to dismiss Harris for 3. 2012 under-11 UAJCA player of the year Joe Hall [Cullingworth] at the crease and they began to build the score-line. Joseph became the aggressor and a fine partnership blossomed. At the half-way [15 overs] point of the innings UAJCA stood at 57 for 1, scoring at just under 4 per over. The pairing matched each other well and the team' supporters gave fulsome support to our two young batsmen. Joseph passed the half-century mark and went to record a highly impressive 68 before being caught by Jones to give Cliffe a second wicket for his efforts at 124-2. It had been a a magnificent high quality stand of 108. Joe remained resolute and when joined by Oakworth' Corey Green the run-rate accelerated well. The innings closed at a hugely dominant 174-2 as Joe and Corey punished wayward bowling in style. Joe was unbeaten on 62 with Corey adding a rapid 21no. Bowler Cliffe posted 2 for 16 from his 6 overs as the main Halifax threat. The Halifax batting had an early blow as James Mukherjee [Skipton] thanked Will Luxton [Steeton] for a tremendous overhead catch off his bowling to remove the dangerous G Whipp for a duck. The 4-1 soon became 8-2 with another catch for Joe Hall to remove the other Halifax opener Jacob Slater for 5 off the bowling of Harry Hollingsworth [Oakworth]. Slater had scored 55 for the under-10 team at Oakworth a few weeks earlier. Joe again got in on the act with a run-out of no 3 Smith for 7 and at 16-3 Halifax faced an uphill task. Another Oakworth bowler Matt Corkindale gave Joe a catch which he did not spill and another run out by James Bloodworth [Cullingworth] took Halifax to 21-5. Halifax no 5 Gannt dug in and with help from Jones put together a partnership of 32 before Jones was bowled by Owen Narey [Wilsden] for 10 at 56-6. UAJCA sensed victory was likely theirs and the bowling was shared. There were further wickets for Tommy Watson [Skipton] and Ellis Marshall [Cullingworth] to leave Halifax almost out for the count at 80-8. The stalwart Gannt had been Halifax' lone star not out with 42 to his name he fell clean bowled by Will Luxton at 84-9. A little tail-wagging by Cliffe carried the final tally to 98 all out with the final wicket appropriately shared by Hall [the bowler] and Holderness the catcher to finish the match in favour of UAJCA. For managers Phil Poole and David Hall it was another cracking start to the campaign to follow the highly successful 2011 tournament, in which UAJCA reached the semi-finals. UAJCA principal bowlers had done us proud and we now look forward to no doubt a stiff challenge from the Heavy Woollen District at Cullingworth on Sunday 30th June. For that match Harry Hollingsworth [injured] and Ellis Marshall will sit out with Fehzan Khan [Gt Horton Church] and Tom Starkey [Skipton] coming in as replacements. Team Managers Dave & Phil accepted the invitation to play Bradford Schools at Bradford Bingley CC. The Schools tallied 96 all out in their allotted 35 overs. UAJCA bowlers performed beyond their experience with Ellis Marshall leading the way with 3 for 2. Cullingworth team-mate James Bloodworth added 2 for 10 and Oakworth's Harry Hollingsworth 2 for 7. There was also wickets for Skipton duo Tom Watson and Richard Starkey. With the bat UAJCA went on to win the game tallying a cracking 97 for 5. Corey Green from Oakworth shone brilliantly with 31no and Joseph Holderness from Skipton helped him along with 19no. Tommy Watson also from Skipton chipped in 21no whilst Hollingsworth, Bloodworth and Owen Narey [Wilsden] also helped us on to the victory. Team Manager Dave Hall added "A superb performance from the trialists with the guys who where missing and playing for Bfd Schools today we have another good team on our hands". James Mukherjee [Skipton] has made it through to County selection whilst Joe Hall [Cullingworth] just missed out. We can be proud of our young players and the future as Dave has said is extremely bright. Upper Airedale suffered heartbreak as they narrowly lost their semi final to North Yorkshire by 5 runs at sunny Saltburn CC. Upper Airedale went into the match as massive underdogs with North Yorkshire having 5 Yorkshire A team players in their side. Upper Airedale won the toss and elected to field. North Yorkshire got out of the blocks really fast going along at over 5 an over. James Mukherjee [Skipton] struck first in the 8th over with the score on 44 when he bowled Hood for 19. Louis Verity [U Wharfedale] & Dan Murphy [Cullingworth] then picked up the wickets of Chisholm (4) and opener Winter (35). North Yorkshire were in a very strong position going into the final 10 overs with the score on 97 for 4, Adil Modak [Steeton] and Ryan Hodgson [U Wharfedale] got Upper Airedale back into the game with some excellent tight bowling only going for 19 in 8 overs, backed up in the field with 3 run outs leaving North Yorkshires innings at an end on 127 for 7, which was an excellent come back and gave Upper Airedale an excellent chance of reaching the final. Upper Airedale got off to the worst possible start losing both openers Louis Horsfield (5) Waseem Qureshi (0) with the score on 10 much relied on captain and Yorkshire player Dan Murphy and he didn't disappoint. Murphy & Verity took the score to 55 before Verity (8) was bowled by Harding. Murphy was joined by Thomas Meakin [Steeton] who continued to add runs and with the score on 77 for 3 with 10 overs to go the game was in the balance. The atmosphere around the ground was fantastic Upper Airedale were well supported with everyone getting involved. Meakin fell with the score on 82 in the 22nd over but with Murphy still at the crease Upper Airedale were still very much in it. Disaster struck when Murphy was bowled by man of the match Winter for 44, when he deserved his 50. Upper Airedale lower order would not lie down, needing 18 from 2 overs. They fell agonisingly 5 runs short with their innings closing on 122 for 9. It was a tremendous match, enjoyed by all and Upper Airedale matched them every step of the way. On another day the outcome might have been different. Manager Phil Poole would like to thank all parents for their unstinting support over the competition. He is very proud of all the boys for their efforts. They have been fantastic and have done themselves and the Association proud. He would also like to give special thanks to Keith Meakin from Steeton for assisting him with the team. Bradford 52 all out, Sheffield 56-7. This has resulted in UAJCA qualifying for the semi-finals. The match will be away from home against the North Yorkshire JCA. 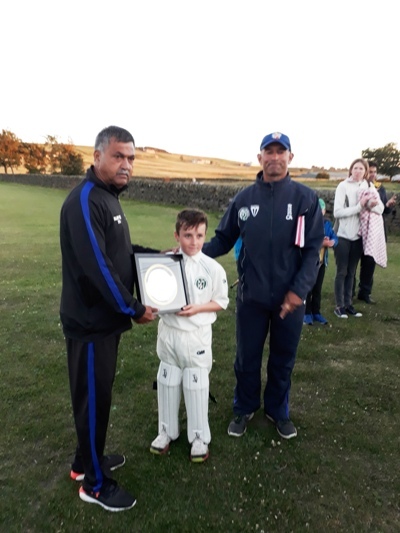 UAJCA' magnificent under-11s continued their 2012 winning ways with a stunning victory against the Bradford League at Pudsey St Lawrence, the famed home of Sir Leonard Hutton. 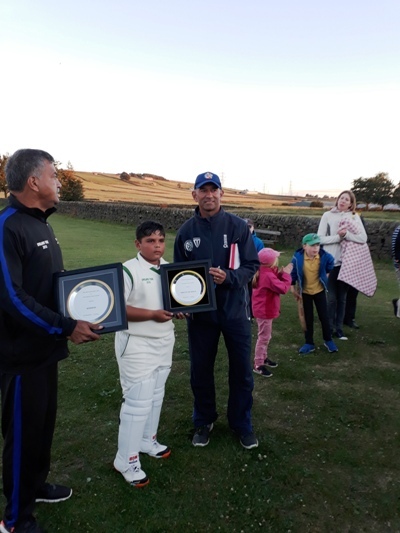 The second UAJCA fixture in the Yorkshire Junior Cricket Festival pitched UAJCA and Bradford together for a second successive year. Upper Airedale made it 2 wins from 2 as they claimed the major scalp of the Bradford League in front of a big crowd at Pudsey St Lawrence as they out batted out bowled and out fielded their opponents..
Upper Airedale won the toss and decided to bat on what looked like a very good Pudsey St Lawrence wicket. Openers Louis Horsfield and Waseem Qureshi got off to a flyer putting on 55 for the first wicket with some excellent running as boundaries were hard to come by. Horsfield fell for 29 in the 11th over when he dragged on to his stumps when set for a big score. Qureshi was the next to fall for 22 when the score was 80-2. He was caught behind off the bowling of Hall. Captain Daniel Murphy and James Robinson continued to add the runs with Murphy bringing up a deserved 50 in the 28th over but was out soon after before the innings closed on 138 for 3 in 30 overs, James Robinson 20 Not Out. Phil Poole congratulated his team for an excellent team performance with everyone playing their part again. Upper Airedale know a victory over defending champions Sheffield will see them reach the semi finals. Phil Poole's young guns did UAJCA proud, inflicting a stunning defeat on our Nidderdale visitors. It is a first victory over any team from Nidderdale and represents a sweet turn-round for UAJCA from the 16 all-out from our under-12s at Nidderdale hands earlier this year. The squad will go into next Sunday's match with the Bradford League in confident mood and they hope to repeat last year's win over our larger neighbours. A fantastic opening bowling partnership by Thomas Meakin [Steeton] 2 for 3 and James Mukherjee [Skipton] 2 for 4 saw Upper Airedale have Nidderdale an amazing 7 for 4 from 8 overs. Louie Verity [U Wharfedale] continued the good work of the openers by claiming 3 for 7 and he almost completed a hat-trick as the hat-trick ball, a yorker was only just dug out. A partnership developed from Bean & Hobbert but a spectacular diving catch from James Robinson [Bradley] broke the stand. Finally Harry Hollingsworth [Oakworth] 1 for 14 and Dan Murphy 2 for 3 polished off the tail to bowl Nidderdale all out for just 49. Runs had been hard to come by on a full-size Bolton Abbey pitch and UAJCA nerves were jangling at 25 for 3. Opener Louie Horsfield [Silsden] 21 not out who never looked in any danger and Thomas Meakin saw Upper Airedale home with 13 overs to spare. The team managers were really proud of the team as everyone had played their part and showed great team spirit for their first game together, an excellent team performance. Team Manager Phil Poole (Cullingworth CC) and assistant David Hall have confirmed their availability and commitment in 2011 to again manage our u-11 campaign to win our first ever LORDS' TAVERNER COMPETITION. On the Glusburn Riviera UAJCA u11s entertained visitors from Bradford in the Yorkshire Junior Cricket Festival (Lords Tavernors). We had been advised that both Billy Whitford and Tom Mawer were required by the White Rose County so the caution with squad selection was well justified. Two of our number had dashed straight from the John Hindle Cup Final at Cullingworth where they had helped their club defeat Ingrow. Joe Heartfield and Daniel Murphy, both of Wilsden barely had time to take breath as UAJCA batted first. Joe and Louis Horsfield were first up but the dash certainly hadn't done Joe any favours as he was soon out for 1 caught & bowled by A Gopal. That may have disturbed Louis for almost immediately he too was back in his home club pavilion, bowled for 2 by W Mizzra. Daniel had replaced Joe and he was joined by Freddy Binns with a rebuild mission most definitely required at 4 for 2. With such a mammoth score to chase the Bradford lads might well have caved in but their resolution would prove to be stern indeed. Oakworth left-armer Joel Fothergill was to upset their early forays and he clean bowled A Slater for 9 and H Spence for 7 in an excellent opening salvo. Opening partner James Rogers whilst wicket-less kept the scoring in check as the two bowlers gave nothing away. The batsmen W Mizzra and A Gopal (ironically also a player at Wilsden) took leaves out of the UAJCA book and Murphy in particular. Only Joshua Addy and Josh Yates really felt pain as all other UAJCA bowlers had exemplary control. The century mark was past but still there was a veritable mountain to climb for the two Bradford batsmen and Mizzra reached his half-century. It was going to be a case of bowlers limiting damage to protect the cracking UAJCA score but the batsmen were clearly well up for it. Gopal had played the support role and he didn't quite make it to 50, finishing not out on 48. His partner Mizzra proved his undoubted class as he approached even Daniel's mark but again the run-rate defeated them. Mizzra ended on 79 not out and the Bradford total on a wonderful 169-2, if still 14 behind UAJCA. It was a real test for our bowlers and they passed it with flying colours. The pick undoubtedly Joel Fothergill with 5-0-17-2 and fellow opener James Rogers 6-0-22-0. Freddy Binns, Thomas Meakin and Louis Horsfield all kept their runs conceded below 6 per over to underline our general control. Indeed more overs from pace-man Meakin might have kept the Bradford lads even more subdued. But what a fantastic match on a great batting strip in warm English sunshine and over 350 runs to savour. In the final analysis both teams had scored 142 from the bat with the difference the number of extras conceded. The UAJCA team now goes to Shiregreen CC in Sheffield for our third match in our bid to reach the semi-finals on 24th July. Our youngsters in the u-11 Taverners suffered the worst of all defeats; on the last ball of the match. The scores were level and with Yorkshire player Tom Mawer bowling the last over our hopes of a tie were high. Sadly for Tom he bowled a no-ball, perhaps striving too hard for the dot ball. But what a match!! UAJCA had a big blow, losing skipper Billy Whitford (Yorkshire & Cullingworth CC) for just 5 runs early in the match with our total on just 13. But Silsden's Louis Horsfield paired well with Daniel Murphy from Wilsden to push on at a good pace. The pairing added 48 taking UAJCA on to 61-2 with Louis caught off Milton for 21. With Freddy Binns at the wicket only another 12 was added before Daniel was our third wicket down at 73 for a marvellous 37. His replacement was Yorkshire's Tom Mawer and the pair added 43 as our score progressed well beyond three figures. Our final wicket fell at 116-4 and that was Oxenhope's Tom Mawer who had batted superbly making 20 before being stumped off Wilkinson. It was time for Freddy Binns to cut loose, which he did with some style. No 6 James Rogers looked on and left him the strike and Freddy obliged by racing on to finish on 42no, James was 2 no and our total a solid 140-4. The Nidderdale innings was spearheaded by Milton and McLachlan towards 22 runs when Tom Mawer clean bowled McLachlan for 11 for a similar early strike. Joined by N Cutts, Milton settled and a half-century partnership flowed from their bats (51) despite tight bowling from Thomas Meakin (Steeton) and Joel Fothergill (Oakworth). The stand ended in an unfortunate run out for Cutts who made 24. It was clear the two sides were well matched with Nidderdale perhaps slightly ahead at this stage. D Tear was bowled by Josh Yates of Earby for 10 at 88-3. And then a real telling strike for UAJCA came from the skipper Billy Whitford taking out opener Milton who had accumulated well for 29 without further addition to the tins. 88-4 and the game was well and truly on. The new pairing of Millhouse and Wilkinson re-built steadily resisting the frugal bowling of Freddy Binns (Cullingworth) and Whitford. They were parted by James Rogers with yet another timber strike at 107-5. This was soon followed by yet another run out as the frantic chase gathered momentum. Papworth had gone for 2 at 115-6. Keeper Wetherall proved to be the partner Millhouse required and they added another 11 in the Nidderdale cause before Whitford again came up trumps via a catch from team-mate Binns. The score-board at Birstwith now read 126-7 and the match was poised to go either way with UAJCA now in the ascendancy. Number 9 Halliday did a grand job helping Millhouse farm the strike and the home total edged nearer and nearer the target. And then it came down to the last over and that last ball. Team Manager David Hall was fulsome in his praise for his young side and he singled out Freddy Binns and Thomas Meakin for particular acclaim. The team now moves on to play Bradford JCA at Glusburn CC with expectation now that they can compete with anyone.